London, H.G.Bohn, 1851. Etching, 310 x 395mm. Coloured. Trimmed from larger sheet. A few small repairs. 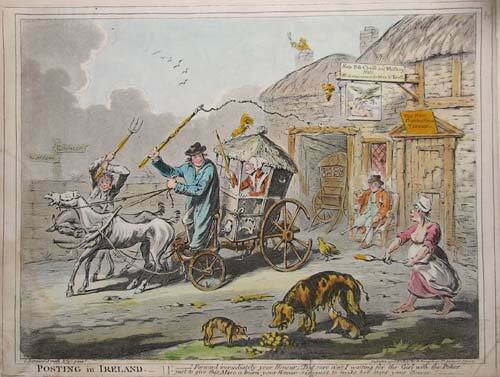 First published 1805, this is a dim view of Ireland, with run-down taverns and coaches, and starving pigs and horses, only a few years after Ireland was incorporated into the United Kingdom in 1801. The signature bottom left, 'C.Loraine Smith', is meant satirically, with Gillray using the name of a well-known landscape painter.